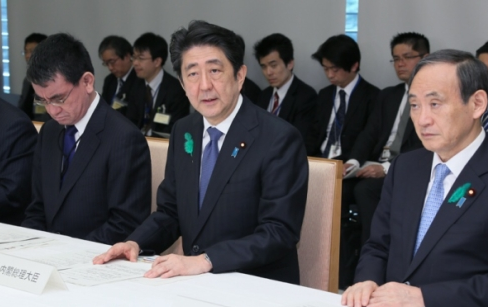 TOKYO — Prime Minister Shinzo Abe held the second meeting of the Emergency Response Headquarters for the Earthquake Centered in the Kumamoto Region of Kumamoto Prefecture 2016 on April 15 at the Prime Minister’s Office. At the meeting, a video conference with Ikuo Kabashima, governor of Kumamoto Prefecture, was conducted, and reports and discussions were held on the situation pertaining to damages and the response of each ministry and agency. “To begin with, I would like to express my heartfelt condolences for the lives lost as a result of this disaster. In addition, many individuals are injured. I express my sympathies for all of those affected by this disaster. “As time elapses, and dawn approaches, the state of damage is gradually becoming clear. Rescue and relief activities for the affected individuals is a battle against time. “The police, the fire department, the Self-Defense Forces (SDF) and others are working through the night to respond, and going forward I request the maximum deployment of operational forces, exerting every effort in relief activities while placing top priority in securing the safety of the public. “In addition, aftershocks are continuing, and there are reports that the weather will worsen tomorrow. Therefore, I request total vigilance to prevent secondary damages, such as through urgently securing safe evacuation locations. “At the same time, the government will collaborate with the affected local governments to secure necessities such as food and blankets, provide medical care, and repair power, sewage and other infrastructure to thoroughly and safely ensure support all affected individuals. A magnitude-6.5 quake struck Kumamoto on Thursday night, killing 10 people and injuring more than 800. A magnitude-7.3 quake shook the region early Saturday morning, killing at least six people, followed by a series of aftershocks, one of them measuring magnitude 5.4. The Japan Meteorological Agency said that the Saturday quake may have been the main one, with the earlier one a precursor.